Dr. Richard Ulmer, Medical Director and Physician at Barrier Islands Free Medical Clinic, has provided well beyond a professional’s lifetime of dignity, compassion, health and good humor to his patients. Across his many decades of training – and then treating – the lowcountry community through his internal medicine practice, it is beyond fitting that Dr. Ulmer would ultimately cap a career of serving others in the best way he knows how: serving even more. Dr. Ulmer, now in his 6th decade of practice as a primary care physician (and 7th year since officially “retiring”), walks into work at the free clinic each morning with what can only be described as a young man’s swagger; age has merely sharpened his wit, carved his empathic worldview, and lent itself generously to understanding the health and wellness needs of the low income, uninsured workers of the Barrier Islands. For those patients who routinely request to see him or are newly referred to him by regulars, Dr. Ulmer has never been the best kept secret of the office – his bowties, deadpan lowcountry sense of humor and disarming merriment are infectious in an otherwise sanitary place of business. And for Dr. Ulmer, BIFMC is most certainly another extension of his lowcountry home and family. 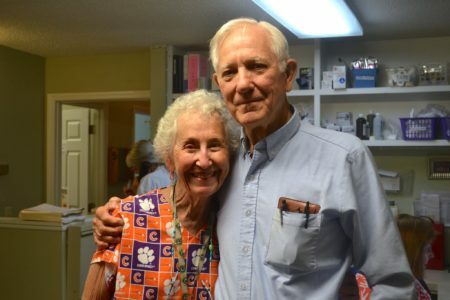 Born in Townville, South Carolina in 1935, as ambitious as Richard’s life direction would prove, he has never strayed far from the backdrop of his roots – and leading a persistent, if not dogged career inspired by helping those in need. After graduating from Hartsville High School in Hartsville, SC, Richard would later receive a BA in Music from Furman University (music being a true passion to this day – Dr. Ulmer has presided as the President of Charleston Symphony Association and was the founder of the Charleston Symphony Singers Guild), and yet he also completed his MD at Medical College of South Carolina simultaneously in 1961. During this time, Dr. Ulmer built a full life around himself; he married his partner Martha in 1958, whom he would share five beautiful children with over the years to come: David, John, Michael, Stephen and Katherine. Dr. Ulmer also joined the US Army Medical Corps in 1966, where he would serve as Chief of Professional Services of the 98th General Hospital in Neubrucke, Germany, until 1969. Upon his return home, he completed his internship and residency in Internal Medicine at University Hospital in Baltimore, Maryland, ultimately returning back to his alma mater in Charleston to finish his training. Settling in Charleston for good, Dr. Ulmer opened a professional practice in West Ashley, both serving on the Board of Directors of Roper Hospital and treating lowcountry families until his retirement in 2005. His retirement would prove to be short lived; within a few short months after leaving his practice, Dr. Ulmer sensed that being a physician had never merely been a career – it was in fact a part of his identity. Joining the free clinic as a volunteer physician in 2007 and later taking on the expanded role of Medical Director in 2013, Dr. Ulmer continues to see as many patients as any volunteer provider – if not more in his expanded role. Often, Dr. Ulmer will jump in to see a last minute patient, or go the extra mile to accommodate a walk-in beyond regular clinic hours – showing incredible compassion at each encounter. Despite his kinder inclinations, patients respect him precisely for his direct approach; he is not afraid to counsel those who do not take responsibility for managing their care, particularly as the clinic treats many suffering from the ravages of diabetes, hypertension and heart disease, and often those who have gone for years without health care prior to learning of the free clinic. For Dr. Ulmer, health care is everything – and everyone equally deserving of its graces. As the #HealthCareForAll hashtag movement wages on social media and the future of the ACA remains on the line under a new administration, Dr. Ulmer is the living embodiment of “Health Care for All” – representing not just a culture of compassion, but the very action of the word. In a phrase, Dr. Ulmer is the very model for a citizenship at its best. To all of those who work and volunteer at Barrier Islands Free Medical Clinic, he is a hero. For the many who fall between the cracks who walk through the clinic doors each day, he is a hero beyond the scope of words. Thanks to physicians like Dr. Ulmer and donors like you, each month BIFMC is able to treat hundreds of uninsured community members that live or work on Johns, James and Wadmalaw Islands. If you would like to make a gift to support our free clinic and services, please Donate Here.